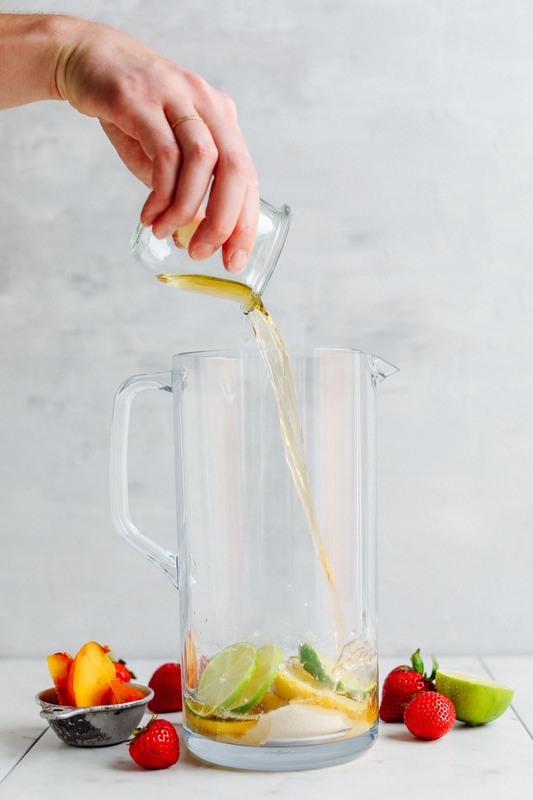 Summer is almost over here in the Pacific Northwest, but I’m still hanging on to every last drop of sunshine with this Traditional White Wine Sangria. 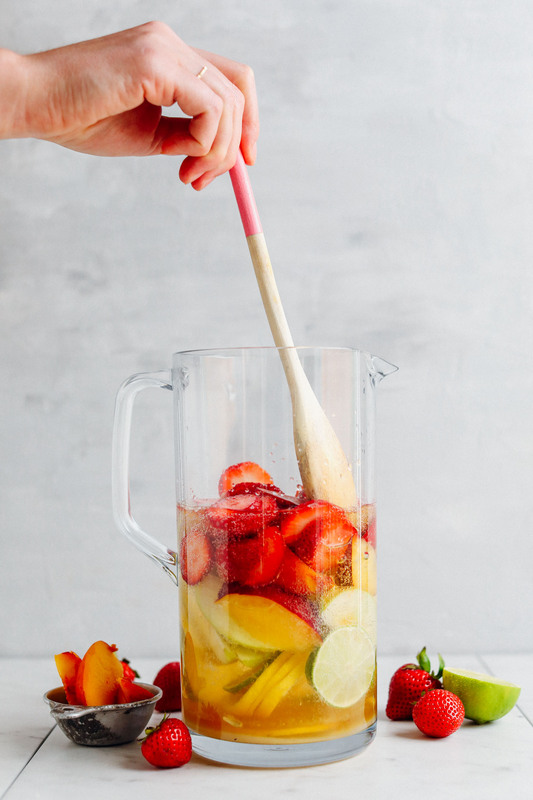 Gather your leftover berries and stone fruit, snag an apple and some wine, and let’s make sangria! 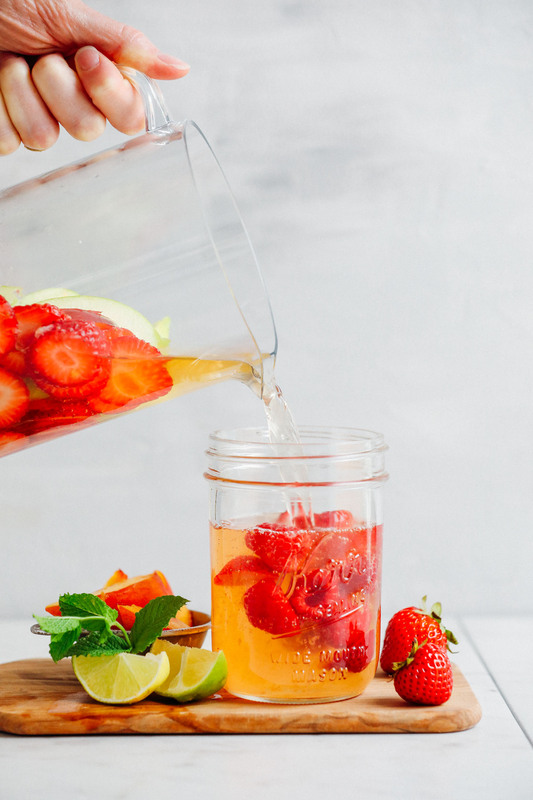 I shared a recipe for Easy Traditional Red Sangria, and you all have loved that! It’s our go-to for hosting and one we enjoy over and over again. So it was due time to create a white wine version. This recipe is simple, requiring just 8 ingredients, 1 pitcher, and 15 minutes to make. The only “special” ingredients it requires are a bottle of white Spanish table wine and apple brandy (brand recommendations included below!). 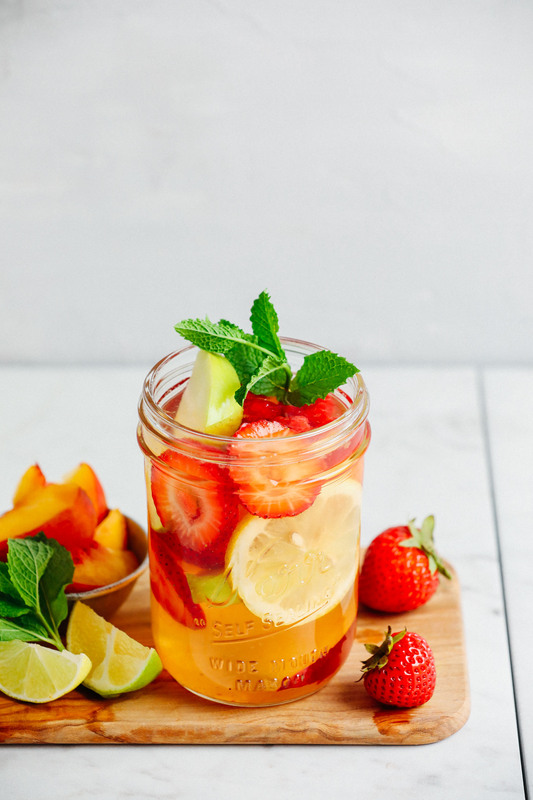 Based on my research, this is a traditional blend of alcohol and wine that creates a crisp but boozy and irresistible sangria. For fruit, I went with plenty of citrus, strawberry, nectarine, and apple. Of course, based on whatever season it is in your country, get creative! Anything that blends well with beverages would likely work here (think oranges, blackberries, figs, plums, and mango). Sangria benefits from a bit of sweetness, and to keep things uncomplicated and pure in flavor, I went with organic cane sugar. But I know some of you avoid sugar, so try sweetening with a comparable amount of either powdered coconut sugar, maple syrup, agave, or stevia to taste. All that’s left to do is muddle and then add the rest of the fruit and booze! This is the fun part. 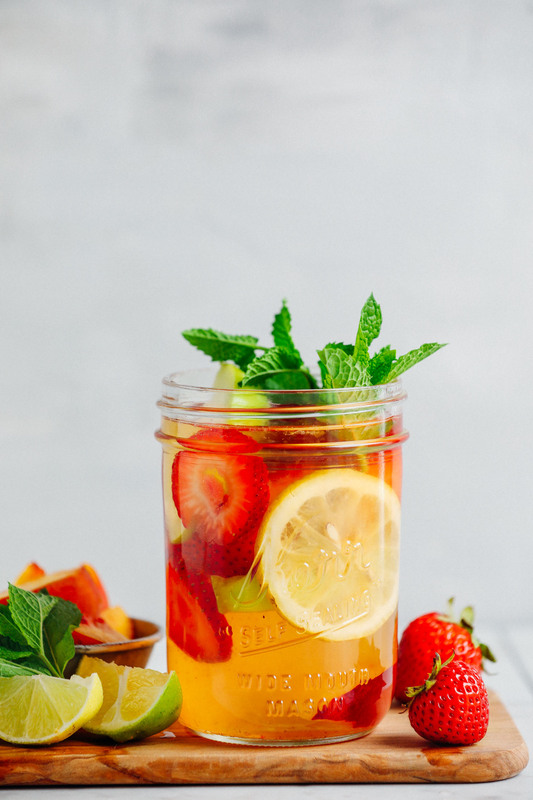 Simply stir and serve over ice or frozen fruit. This can be made up to 24 hours in advance, which makes it ideal for making ahead for parties and gatherings. This would make the perfect easy beverage for Spanish-inspired meals or tapas dishes like Patatas Bravas (mmmm, take me back to Spain already). Pair this delicious sangria with just about anything spicy or Spanish/Mexican-inspired, like Quinoa & Vegetable Stuffed Portobello Mushrooms, Roasted Cauliflower Tacos with Chipotle Romesco, Garlicky Sweet Potato Noodle Pasta, Quinoa Taco Meat, or Butternut Squash Portobello Tacos! If you try this recipe, let us know! Leave a comment, rate it, and don’t forget to tag a photo #minimalistabaker on Instagram. We’d love to see what you come up with. Cheers, friends! 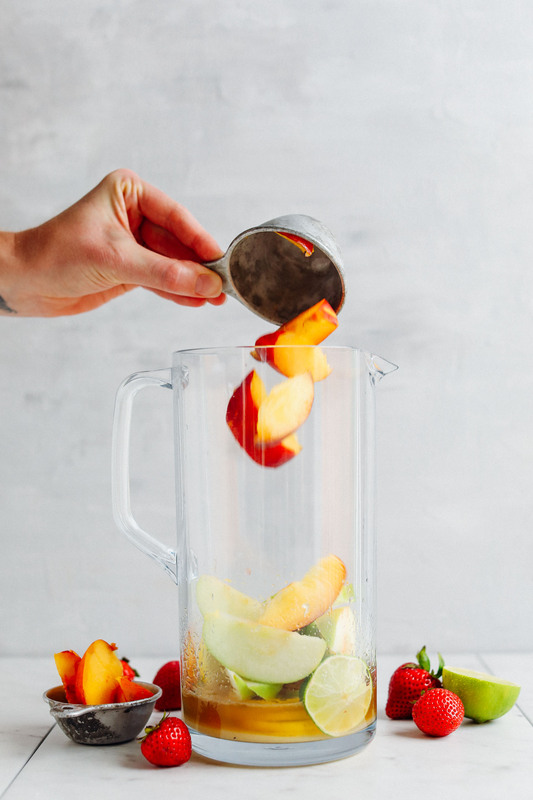 An easy, 8-ingredient (1-pitcher!) 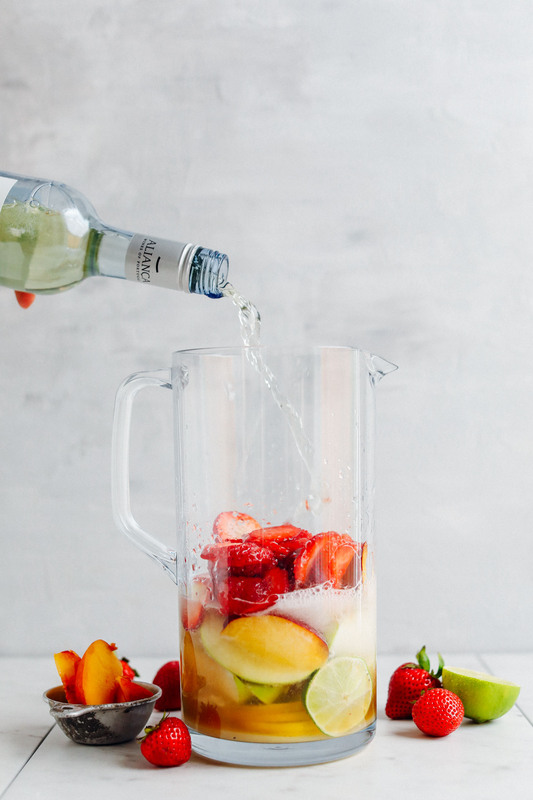 recipe for traditional white wine sangria. Brandy and wine recommendations included, and seasonally adaptable! 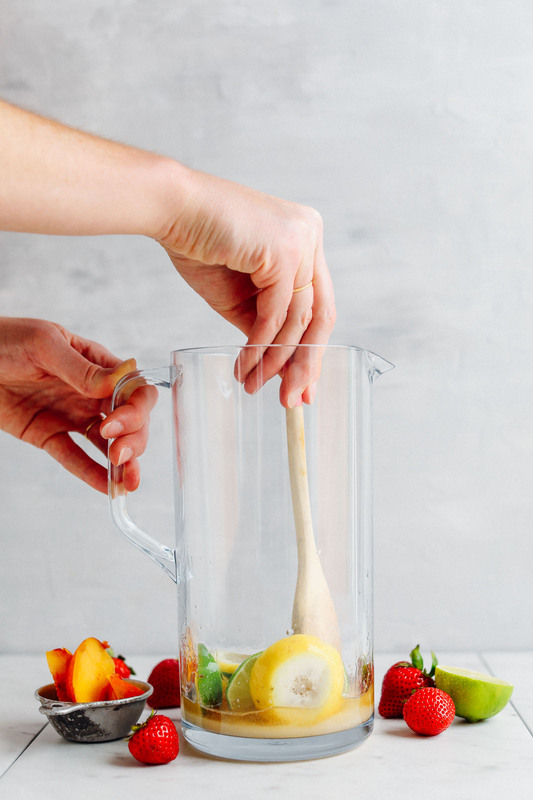 Add lime, lemon, and sugar (or other sweeteners) to a large pitcher (or use multiple pitchers if making a larger batch) and muddle with a muddler or wooden spoon for 45 seconds. Add apple brandy and muddle again to combine for 30 seconds. 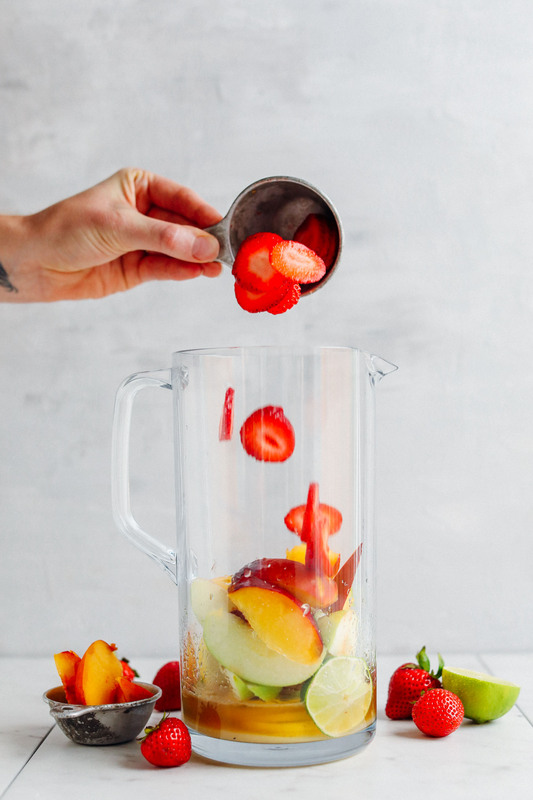 Add apple, nectarine, and strawberries and stir to incorporate. Then add wine and stir once more. 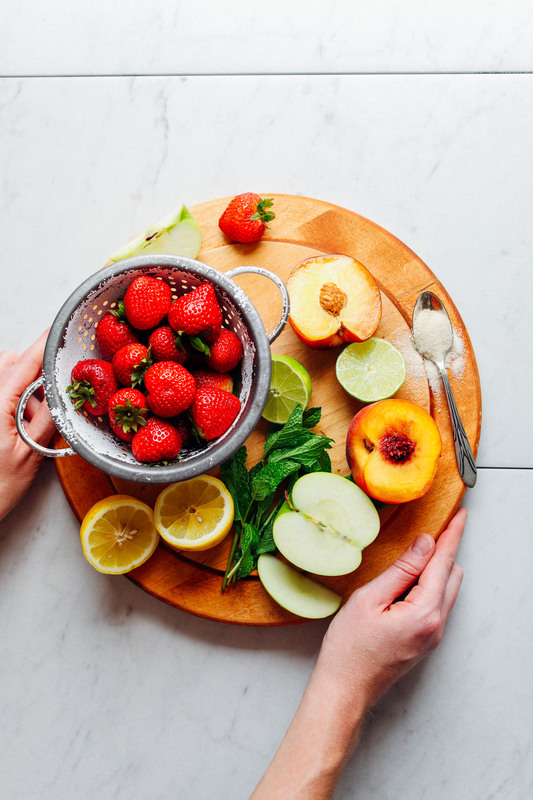 Taste and adjust flavor as needed, adding more sweetener of choice for sweetness, lemon or lime juice for acidity, or fruit. Stir to combine. Add ice or frozen berries and stir once more to chill. Serve as is or with a bit more ice and mint (optional). To dilute the mixture, top off glasses with a bit of sparkling water (optional). *Nutrition information is a rough estimate calculated with Pinot Grigio and cane sugar. Can you add rum instead of Brandy like in the red sangria? I think with Sangria, anything goes. If it tastes good to you put it in. I made this recipe with Muscato to skip the added sugar entirely. I added raspberries and a “splash” of mango flavored sparkling water. I also used barely ripe white peaches to keep some crunch. Delicious! Glad you enjoyed it, Kristen! Thanks for sharing your recipe changes! I made this Sangria & everyone loved it! Thank you ? Made this a few weeks ago and it’s amazing! Very refreshing on a hot day. I love that you can use whatever fruit you have. Thanks for the great recipe. Try adding a few sticks of cucumber, ala UK Pimms, gives a delightful freshness. just made this for thanksgiving with a couple tweaks based on what i had in the house. it’s delicious!! when i have the chance, i’ll be making this again and i’ll stick a little closer the the recipe. ? Thanks for sharing your changes, Lisa! You talk about Spanish with wine and your photo reveals a Portuguese white wine??? 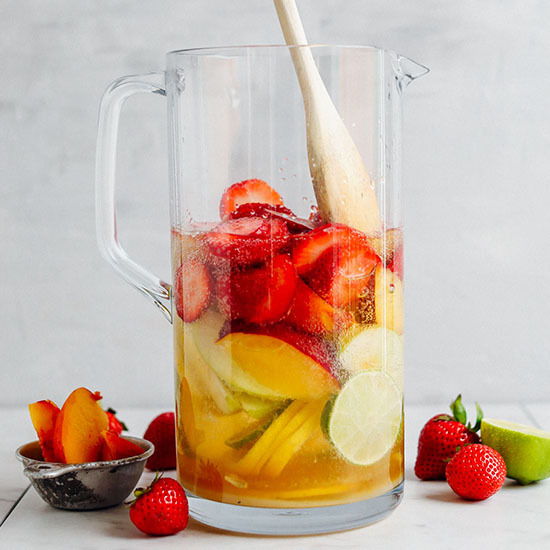 What a lovely sangria recipe, thank you for sharing! However, and being a portuguese musselina, I couldn’t help noticing that the wine you used in the photos is actualy a portuguese wine and not a spanish one, from the wine company Caves Aliança (www.alianca.pt). Your pictures are stunning and the sangria looks delish! It’s summer here in India. I will definitely give it a try. Could you link a lemonade recipe? I want it badly. This looks yummy! I hate to be that *person*, but being 1/2 Spanish I feel like it has to be said… White sangrias aren’t technically traditional. 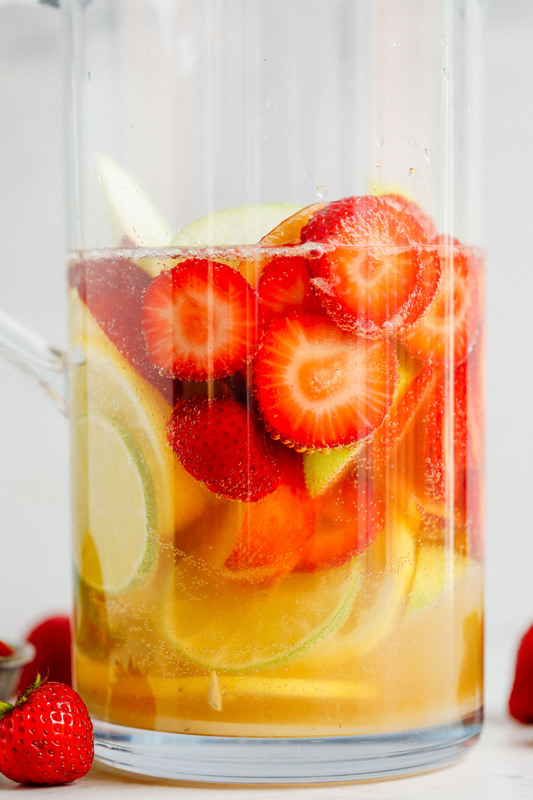 This could be accurately called “Easy White Sangria,” leaving out the word ‘traditional.’ Again, looks yummy! I love both white and red versions of this deliciousness. Thanks for sharing another great recipe! I used ripened fruit which added sufficient sweetness and it was amazing and beautiful! It was hard to stop at one glass. I used ginger brandy because I had it in the house and it was ?? Where can I get apple brandy in Malaga province Spain ?? ? I LOVE white sangria! We are hunkered down for Irma but as soon as the stores reopen I will be making this to celebrate. Thanks Dana!